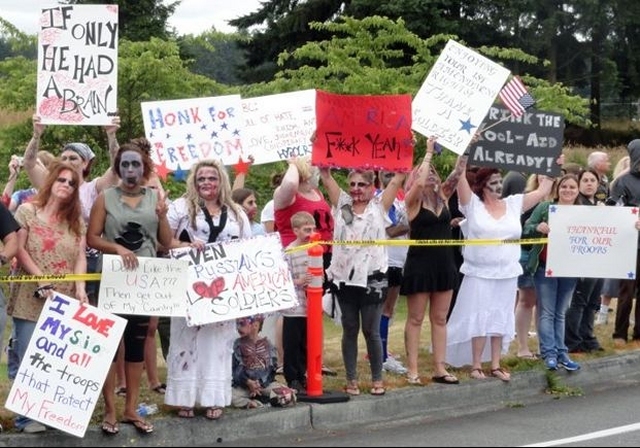 »Undead News»Westboro Baptist Church Protest Countered by… Zombies! Westboro Baptist Church Protest Countered by… Zombies! A Westboro Baptist Church protest was overshadowed Friday when demonstrators dressed as zombies gathered at a DuPont, Wash. military base to counter the radical group’s efforts. About 300 counter-protesters showed up in varying degrees of zombie garb, far outnumbering the picketers from Westboro. According to KIRO in Seattle, just eight protesters from the controversial group showed up. “I think that their message is very hateful, and Jesus was not a hateful person. He loved everybody,” one of the counter-protesters told KIRO. While it is unclear why Westboro Baptist Church targeted the DuPont military base for its latest effort, the group frequently pickets military funerals. The group believes that deaths in Afghanistan and Iraq are God’s punishment for the United States’ tolerance of homosexuality. Last year, the group announced it would “quadruple” protest efforts after the Supreme Court ruled that such demonstrations are protected by the First Amendment. However, counter-protests like the zombie effort in DuPont are becoming increasingly popular. Earlier this month, thousands of people in red shirts formed a human wall around a fallen soldier’s funeral to block the anti-gay protesters. At a similar protest at Texas A&M University, students dressed in maroon formed a circle around a funeral and seemingly discouraged Westboro protesters from ever showing up.